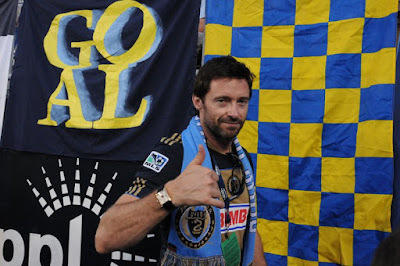 So it would seem that Wolverine aka Hugh Jackman is a fan of the Philadelphia Union. Last night he was at the game, kitted out in home jersey and SOB scarf, standing right below the River End. A ripple went through the crowd when he arrived, and we started chanting "Wolverine...Wolverine." It might have been the best thing about the 0 - 0 draw. More on Jackman and other celebs attending the game at The Brotherly Game.